Pictured here is an image of the 737 MAX 8 in ALC livery. FARNBOROUGH, United Kingdom, July 9, 2012 /PRNewswire/ -- Boeing (NYSE: BA) and Air Lease Corporation (NYSE: AL) announced today a firm order for 60 737 MAX 8 and 15 737 MAX 9 airplanes, with reconfirmation rights for 25 additional 737 MAXs. The order, with a list-price value of $7.2 billion, represents the first 737 MAX order by a leasing company. 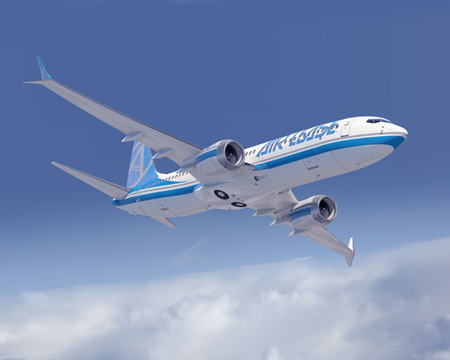 "The 737 MAX is an excellent addition to our portfolio and the ideal complement to our growing fleet of Next-Generation 737-800s," said Steven Udvar-Hazy, chairman and CEO of Air Lease Corporation. "The 737 MAX represents a step-change improvement that our airline clients need to compete in the future." The 737 MAX is a new-engine variant of the world's best selling airplane and builds on the strengths of today's Next-Generation 737. The 737 MAX incorporates the latest-technology CFM International LEAP-1B engines to deliver the highest efficiency, reliability and passenger comfort in the single-aisle market. Airlines operating the 737 MAX will see a 13 percent fuel burn improvement over today's most fuel efficient single-aisle airplanes and an eight percent operating cost per seat advantage over tomorrow's competition. "This 737 MAX order continues ALC's disciplined approach to building its young, fuel-efficient fleet," said Boeing Commercial Airplanes President and CEO Ray Conner. "The ALC leadership team has an excellent record of placing Boeing airplanes with airlines worldwide. They are an ideal partner to help establish the 737 MAX in the leasing market." The ALC order builds on the continued market success of the 737 MAX. To date, the 737 MAX has orders and commitments for more than 1,000 airplanes. ALC has ordered a total of 170 airplanes from Boeing including 75 737 MAX, 78 Next-Generation 737-800s, five 777-300ERs (Extended Range) and 12 787-9 Dreamliners.